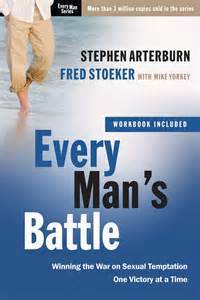 Recently I had the opportunity to read Every Man’s Battle by Stephen Arterburn and Fred Stoeker. Having previously read Every Young Man’s Battle while in High School, I looked forward to reading this book, recalling their paradigm influencing suggestions concerning purity that I had previously engaged. In reading this book, I was not disappointed. The topic of sexual purity is one that gets precious little mainstream attention. Often championed by American Christians of the Evangelical variety, this movement seeks to foster a wholesome worldview that combats sexual promiscuity, hook-up culture, the objectification of women, and the destruction of marriages. Arterburn and Stoeker write this book specifically for men, including men who are married, as a guidebook on how to think and live in a God-honoring way that allows men to truly and appropriately love their wives. The author’s real-life experiences, reflections, and suggested steps are a great resource for thinking about purity in one’s own life, as well as providing practical measures to live more purely. Throughout this work the author’s perspective comes across clearly, with an excellent set of examples and real life application steps. For men with “systematic” minds, there are a number of steps and “checklists” to work through, which I found to be helpful and able to be applied in real life. Too often I read books that suggest things that sound good on paper, but don’t work well in real life. The practical steps suggested in this book actually can work in the real world. Especially helpful in this regard were several extremely practice-oriented feature, including several thought-revealing quizzes, and an extensive workbook and discussion guides. These resources are both insightful and useful as you read through book (providing practical application for what was just said) and as you apply principles of purity. As the writers are coming from a Christian position, some extensive Biblical exegesis concerning purity, especially of the mind, would have made for a stronger overall case. While there are section detailing some passages on purity, such as Job’s covenant, much of the scriptural material in this book has been applied in a rather “proof-text-y” and out of context manner. This is not to say that the contents of the book are un-Biblical or the practical advice is untrue– I would argue just the opposite. However, the way in which the scriptures are used is potentially problematic. Another thing that I would like to have seen more of in this book was commentary on marriage and the how the Christian meaning of marriage should be used to combat impurity, inside and outside of marriage itself. Apart from the use of Bible verses, a large part of this book could have been from any non-Christian author in a self-help section. In future editions, some revised texts and conversations that are more thoroughly Christian in their worldview would continue to make this book an excellent resource. Overall, I would highly recommend this book for Christian men, especially those who are married or have dealt with impurity in the past. Speaking as someone how has taken seriously the principles in this book (and in Every Young Man’s Battle), I know that the suggestions in this book work. This would make a great men’s small group workbook as well, and has merit as a resource for those seeking to help other men overcome the snare of sexual impurity. And so I recommend that you consider picking up a copy of Every Man’s Battle today. Every Man’s Battle: Winning the War on Sexual Temptation One Victory at a Time. Stephen Arterburn, Fred Stoeker, and Mike Yorkey. Waterbrook Press: Colorado Spring, 2002 Edition. I received this book from Waterbrook Press free of charge in exchange for my honest review. All opinions expressed are my own. I really enjoy the “Every Man” series… you mentioned that you wished the book dealt more with marriage, but there is also “Every Man’s Marriage” and “Every Man, God’s Man,” which deals more with that subject.